I came across this book on a used book shelf and it stirred my interest. I have heard of the Winona Lake Bible Conferences and also the connection of Grace Theological Seminary to Winona Lake. Gaddis wrote the first edition in 1949 and in 1960 Huffman updated the history with a few chapters. These conferences included such names as D.L. Moody, Billy Sunday, G. Campbell Morgan, James Whitcomb Riley, W.E. Biederwolf, J. Wilbur Chapman, and Gipsy Smith. The music was most often conducted by Homer Rodeheaver. 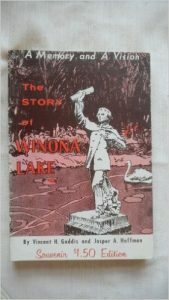 The resort would eventually grow into the town of Winona Lake and, perhaps best known to many today, would become the home of Grace Theological Seminary with Alva J. McClain and Herman Hoyt. The resort/town of Winona Lake would also house many and varying ministries such as the Free Methodist Publishing House, the Brethren Missionary Society, the Rodeheaver Company, the Winona Lake School of Theology founded by G. Campbell Morgan of London, Koscuisko Presbyterian Youth Camp, the Oriental Missionary Society, the Winona School of Photography, and even the beginnings of Youth for Christ with Billy Graham in his early days. Though the conferences have ended, the seminary still operates and the town itself boasts around 5000 people with an ongoing tourist business.